Everyone who knows me in real life (and even online) know that I am a great big chicken. I don’t like anything scary, both in movies, TV or books. Oh, I used to like them when I was younger, but I always, always scare myself silly that I end up not being able to sleep peacefully or go to the comfort room for a week or so because my imagination kept bringing up all the scary things I heard/read/talked about. I know there’s a delicious feeling to being scared, but when you keep on running in and out of the comfort room to pee for a week, it’s not fun. That’s one of the reasons why I delayed reading Anna Dressed in Blood by Kendare Blake until know. 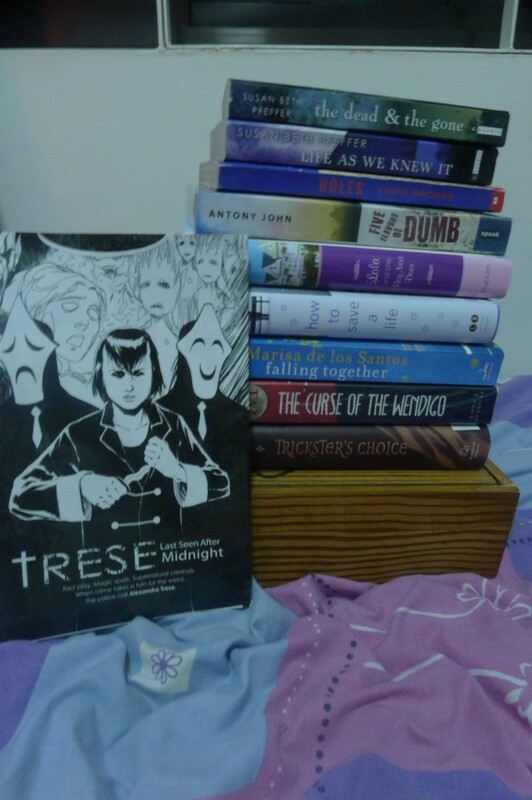 I borrowed this from Maria after our Quezon trip with other Goodreads friends but I never picked it up. I always put it off because I said I had no time, and then I said I won’t read it yet because it’s Christmas and I don’t want to be scared, and then I said I won’t read it yet because I don’t have any company at home and God knows what happens when I’m scared at night and alone. This week, though, I got my brave face and finally, finally picked it up, hoping that my parents’ presence at home would make me less frightened. Like I said: I’m a big chicken. Cas Lowood is a ghost hunter — not the ones you see on TV but someone who puts ghosts who harm living people to sleep. It’s not like those normal Healthcare Administration Jobs that other people got, but Cas feels this is his destiny. When his father died, he took over the “business” with his white witch mom and their pet cat, and they moved from one place to another, killing these ghosts. Cas and his mom arrives in a town where the famous ghost called Anna Dressed in Blood haunts a house. Anna was killed fifty years ago, her throat cut open spilling over the white of her dress, making her look like she was dressed in actual blood. Cas was just expecting to kill her and move on, but he finds it extremely difficult to do so — Anna was not an ordinary ghost, and for someone who’s full of rage and kills anyone who enters her house, she shows mercy and spares Cas’ life. It’s a surprisingly fast read and I found myself devouring the story. At its core, Anna Dressed in Blood is more of a paranomal novel than horror, but it isn’t the usual one with a whiny heroine and a brooding hero. True, Cas has some kind of arrogance with the way he does his work but he grew on me, and his brooding periods didn’t really have that much screen time. Anna was a mystery even up to the end, and I feel like there is still more to her than what was revealed in the story. Their relationship was…well, kind of cute, and I know how odd that sounds in a horror story. Let’s just say it was one of those pairings that was very interesting to read. I love the supporting cast in this one: Thomas, Carmel, Cas’ mom and especially the cat, Tybalt. Novels with animals are a huge plus for me. I like Thomas’ stubbornness and Carmel’s courage in the face of the unknown. Cas’ mom reminds me of someone who would offer tea and cookies to her son’s friends and amaze them with stories. Anna Dressed in Blood‘s characters feel like a well-rounded sort of bunch, and it was a pleasure to read them. 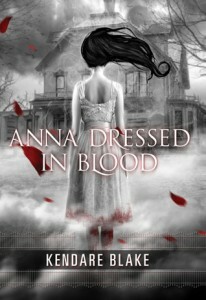 Reading Anna Dressed in Blood felt like I was watching a Supernatural episode, sans the brothers and the car and the shooting. I really enjoyed reading this book. This book didn’t change my aversion to anything scary, and I still won’t go read the real horror novels or go watch scary movies anytime soon (maybe ever). But I think I am most definitely reading the sequel, Girl of Nightmares, when it comes out this year. But I will probably read it in broad daylight again.